Signup for your free sangkrit.net account and promote your personal outlet of a globally distributed order via your personal app by giving it a global exposure. When you signup for your free sangkrit.net account, you work as personal outlet of the globally distributed order of Sangkrit for upgrading humankind into internet age. You promote your business via getting your personal app published on google play. Your prospective clients download that on their smartphone to keep in constant touch with you. You work via that to get paid hourly per terminal direct into your bank account. You save substantial money by not opening your brick-mortar office as that becomes unnecessary here. So a part of that saving, you must invest upon promoting your personal app to work with your clients from worldwide in close cooperation. Buying global exposure of Sangkrit for sometime is the best way of doing that. You promote your personal outlet via your personal app by giving it a global exposure so that you change the world by bringing everybody’s business online. While doing so you simply mention your unresolved difficulties to get any necessary cooperation from other personal outlets from worldwide. The globally distributed order of personal outlets is always there to let you make every breakthrough basis hourly per terminal support rates onward from ₹ 2000. Such reasonable rates beat all your competition. Nobody gives anything better giving any greater impact upon globalization so you succeed. Let your customers also go that way because you are there as revolutionary vanguard to build the whole new civilization of internet age. 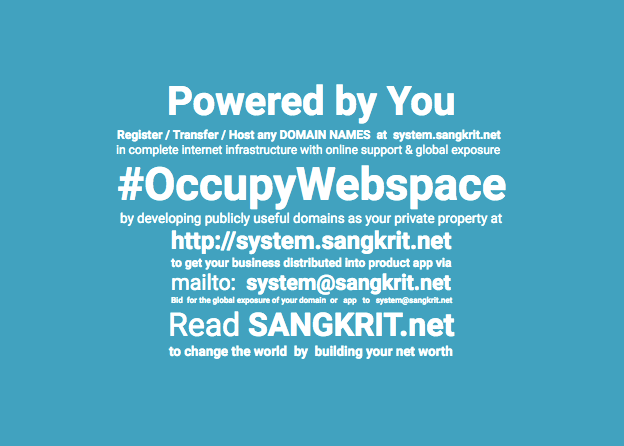 Help them signup for their free sangkrit.net account. Help them have their personal apps as a new social way and help them promote their reputation by bidding for the global exposure of Sangkrit. Previous PostStalinism Is Continued Through Internet Age And Its Smartphone StageNext PostIs Violence Disrupting State ?